Caithness is the northeastern extremity of mainland Britain. Everyone has heard of the tiny village of John o'Groats but this county has a stunning coastline, from Dunnet Head, the most northerly headland, to the Great Stacks of Duncansby and the remarkable Whalligoe Steps. The area is rich too in archaeological remains with some of the best-preserved surviving brochs and chambered cairns to illustrate the distant past. The towns of Thurso and Wick are surprisingly amongst the largest in the Highlands, with Thurso's port of Scrabster being the main gateway to the Orkney Islands beyond. 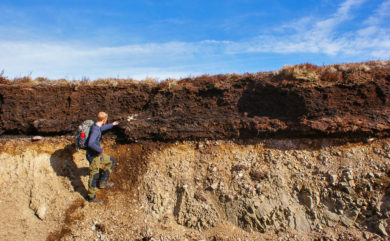 Ben Dolphin looks at the importance of our peatlands - such as the Caithness Flow Country. "Peat. Don’t you just love it? Well, if you’re a hillwalker there’s a good chance that you don’t, because when it’s exposed at the surface or when it comes served with its standard topping of spongy luminous moss, it can be a thing of real anguish..."